Barcelona registered a 2-1 win over PSV on Wednesday night thanks to goals from Lionel Messi and Gerard Pique, so as to seal the top spot in their Champions League group. While the Argentinian scored the opener with a strong left-footed strike, he assisted the second through a direct free-kick, which was poked in by the centre-back from inside the penalty area. 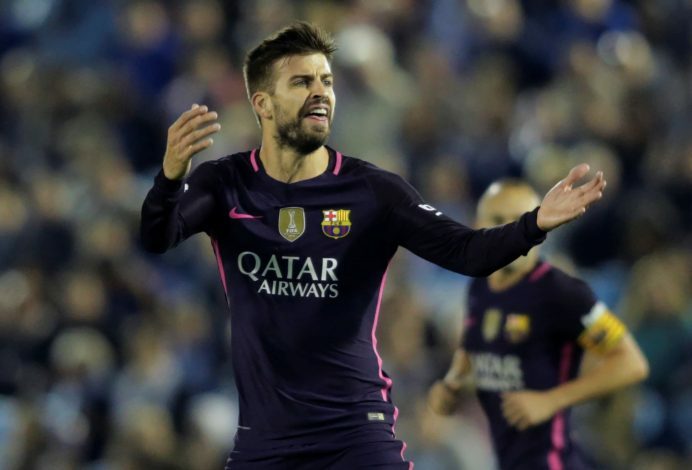 While this goal seemed pretty accidental from the get-go, Pique remained adamant that it was smartly planned and practised on the training ground, during his post-match interview. “We’ve practiced that free-kick a lot,” declared the Spanish international, as his goal eventually turned out to be the winner against the Dutch side. Cheeky by Pique, but the goal has gotten him closer to breaking a significant record, as the 30-year-old is now just 4 goals away from becoming the top-scoring defender in the history of the Champions League, presently trailing only Ivan Helguera (15) and Roberto Carlos (16). A new record was also broken by Leo Messi on the night, as he surpassed Cristiano Ronaldo to become the most prolific Champions League goal-scorer for a single club with his 106th strike.